AUTHORS: Cracknell, Tamsin; Tarnow, Dennis P.; Chu, Stephen J. Restoration of single teeth in the anterior maxilla is often restricted by the angulation of the tooth root with respect to the crown angle. This makes screw retention difficult, as the screw access hole often emerges through the facial aspect of the tooth. Cementation is dictated in these cases, which has been shown to increase incidence of biologic complications and inhibit retrieval and maintenance. This CT study aimed to quantify the range of root-cingulum angulation observed in single central or lateral maxillary incisors (teeth 7-10). Forty-nine patients (28 female; 21 male) with mean age 44.2 years (range 18-74) underwent routine diagnostic CT scans. The scans were analysed retrospectively using implant planning software. A “root axis” was defined from root apex to incisal edge, and a secondary axis representing the ideal screw access hole channel, positioned through the cingulum to the midpoint of the cemento-enamel junction. Mean root-cingulum angulation over all teeth was 20.84° (SD 2.10°). The range of angles was 16.82° – 24.90°. When comparing lateral and central incisors, there was a negligible difference in mean (20.85° vs 20.84°), maximum (23.23° vs 24.90°) and minimum (17.74° vs 16.82°) values. No correlation could be observed between angulation and gender, or age. The angular offset between tooth root axis and prosthetic screw axis is commonly in the region of 16° – 24°. Clinicians and laboratory technicians should bear this in mind when planning implant restorations. Single-tooth replacements in the anterior maxilla would benefit from the use of angulated-platform implants to mitigate oblique stresses on the implant-abutment complex and enable screw-retention. 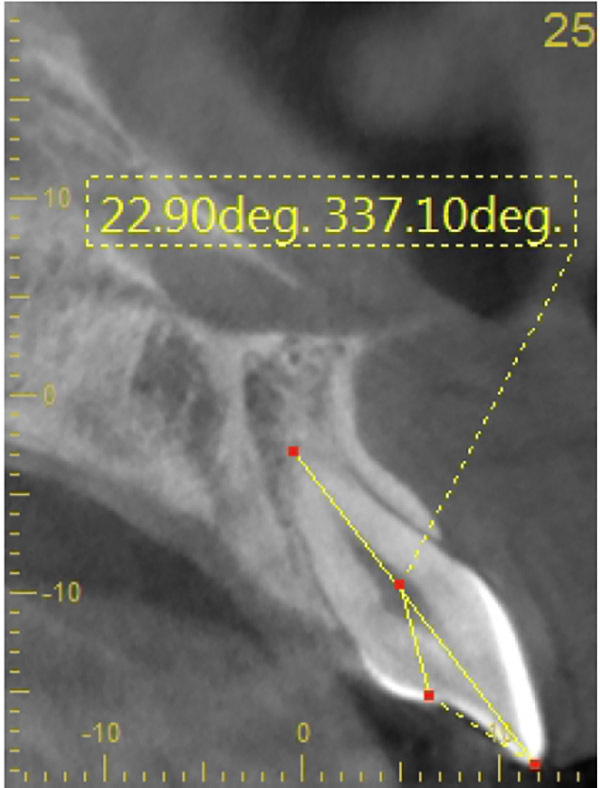 Figure 1: CT scan measurement of angle between “root axis” (root apex to incisal edge) and “screw axis” (cingulum to midpoint of cement-enamel junction) using implant planning software.